Select response time: from less than 1.5 ms to 5 s.
Consumption: 35 mA or less. Our new ZSE10(F)/ISE10 pressure switches really do fit the bill when lack of available machine space is an issue. Designed specifically with space savings in mind, and measuring only 9.8 mm width, they offer similar performance to our popular ZSE30A/ISE30A models but require around 50% less mounting space. Further features of these switches include a copy function where the setting of the master sensor can be copied on up to 10 slave sensors simultaneously resulting in reduced setting time and human setting errors. Also, all settings can be protected against unwanted manipulation using the switch's password setting function and with their improved multi ?angle direction visibility; vacuum suction and pressure checks can be made at a glance. Available in direct, panel and DIN rail mounting options and with side or rear piping directions, these digital pressure switches really lend themselves to multiple switch applications when panel space is restricted. And in keeping with our commitment to help save energy, these switches are also extremely energy efficient as they consume around 20% less power thanks to their in-built power saving function. Based on our successful ZSE/ISE 30 Series, our new high precision digital pressure switch, Series ZSE30 A(F) / ISE30A, with dual colour display, offers even more high performance features. Now available with either NPN or PNP dual open collector outputs, or with the addition of an additional analogue output (voltage or current), the sensors improved copy function also allows you to simultaneously set up to 10 slave monitors whilst setting the master. With a simple to follow three step setting process and the addition of a password setting function, potential errors, lengthy setting time and unwanted manipulation are kept to an absolute minimum. Further features of the CE, UL/CSA and RoHS compliant ZSE30 A(F) / ISE30A include a power saving function, which reduces energy consumption by up to 20%, various piping options and direct or panel mounting capabilities. Based on our successful ZSE/ISE 40 Series, our new high precision digital pressure switch, Series ZSE40 A(F) / ISE40A, with dual colour display, offers even more high performance features. Now available with either NPN or PNP dual open collector outputs, or with the addition of an additional analogue output (voltage or current), the sensors improved copy function also allows you to simultaneously set up to 10 slave monitors whilst setting the master. With a simple to follow three step setting process and the addition of a password setting function, potential errors, lengthy setting time and unwanted manipulation are kept to an absolute minimum. Further features of the CE, UL/CSA and RoHS compliant ZSE40 A(F) / ISE40A include a power saving function, which reduces energy consumption by up to 20%, various piping options and direct or panel mounting capabilities. To compliment and extend the existing SMC Digital Pressure Switch ranges, we are pleased to unveil our new Series ZSE/ISE 80 which has been specifically designed for use with a wide range of fluids thanks to its improved, corrosions resistant stainless steel, wetted part construction. Pressure ranges can easily be monitored via its dual colour display either in Vacuum (-0.1 to 0 MPa), Compound (-0.1 to +0.1MPa) or Positive (-0.1 kPa to +1 MPa, -0.1 kPa to +2 MPa) regimes, dependant on its application, and with the option of an analogue current output, this new switch makes remote location mounting a perfect selection. When R&D engineers from leading automation control experts SMC Pneumatics were asked to develop a compact, high pressure switch, incorporating a large digital display, to monitor both coolant and hydraulic fluids ? the new Series ISE 70/75 was their perfect response.Effectively extending the existing SMC pressure switch range, these high performance, yet lightweight, pressure controls are available in three options: ISE 70 for use with air or inert and incombustible gases - monitoring a set rated pressure range between ?0.1 to 1MPa, and the ISE 75 and 75H models for use with fluids requiring a set rated pressure of up to 10MPa and 15MPa respectively.With die-cast aluminium bodies and 4 setting control options, the operating status can be quickly seen, by viewing the highly visible 10mm high character dual colour displays.Available with 2 or 1 outputs, Rc, NPT or G1/4 port thread options and with fixed or selectable MPa or PSI pressure indications, these switches conform to both CE and UL/CSA global accreditations and IP67 enclosure ratings, making them the ultimate solution in high pressure control. Series PSE digital pressure switches allow pressure to be controlled from a remote location. Series PSE540 is compact and lightweight, allowing the sensor to be mounted where needed. The use of stainless steel 316L for all wetted parts allows the PSE560 pressure sensor to be used in a wide variety of gas and fluid applications. The air checker, PS1 series, electronic pressure switch is available for positive pressure and for vacuum. PS1 is extremely compact and lightweight. Dimensions are 13W X 10H X 30L (mm) for standard type without connection part. A 2-wire switch is applicable to either NPN or PNP output. Digital Pressure Switch. Built-in Regulator. Applicable series: AC /AR /AW /ARM /ARP. Applicable fluid: Air, Non-corrosive gas, Non-flammable gas. Display pressure range: -0.1 to 1 MPa. Wiring entry: Top / Bottom. Following an extensive review of our popular Solid State IS1000 pressure switch, our R&D engineers have totally redesigned the product and have added even more performance improvements. Its replacement reed type pressure switch, our new Series IS10, is now around 11% shorter and 16% lighter than the previous model. As the pressure switch can be connected directly to modular F.R.L. units improved handling and mounting is ensured and with easier setting and a clearer visual display, operational performance is enhanced. Suitable for use with pressure ranges from 0.1 to 0.6 MPa, depending on your selected model, the new Series IS10 offers a service life of five million cycles and is both RoHS and CE compliant. Pneumatic pressure switch series IS3000 can be used for small electrical loads of 10mA such as relays and programmable controllers. IS3000 has a high frequency operation of 1 cycle/sec and a long life of 10 million cycles due to piston construction. Calibration ranges from 0.1 to 0.7 MPa. The ISA series is a non-contact style air catch sensor for applications requiring confirmation of work present for machining operations. Due to the construction of the sensor, fluctuations in the supply pressure does not influence operations. The ISA series is IP66 rated and is dust proof and drip proof. The ISE1 series is a compact, positive pressure switch available in a single setting with hysteresis adjustment, a double setting/double output type or an analog output type with hysteresis adjustment. The ISE1 is lightweight and the optional plug-in connector makes wiring easy and simple. The ISE2 series is a compact, pressure switch (for positive pressure) and can be integrated with ZX or ZR vacuum systems. The ISE2 series pressure switch has a quick response time of 10mS and the plug connector option makes wiring easy and simple. The ISE3 series is a digital pressure switch (for positive pressure) with LCD readout for general pneumatics purposes. 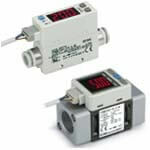 The ISE3 digital pressure switch allows the calibration of two independent outputs. Modular version can be integrated with ZX system. Series ZSE30A is a high-precision, 2-color display digital pressure switch for vacuum. It has raised rubber button controls that are clearly set apart, simple to operate and soft to the touch. Plug in type connectors take the burden out of wiring work and maintenance. Four different display settings are available. The ZSM1 series diaphragm type vacuum switch is available in a solid state non-contact or a reed type design. The ZSM1 has a response time of 100 ms. It is lightweight, compact and has a long life. The ZSM1 has a standard shield plate that prevents external interference. The ZSE1 series is a compact, vacuum pressure switch available in a single setting with hysteresis adjustment, a double setting/ double output type or an analog output type with hysteresis adjustment. The ZSE1 is lightweight and the optional plug-in connector makes wiring easy and simple. The ZSE2 series is a compact, pressure switch (for vacuum pressure) and can be integrated with ZX or ZR vacuum systems. The ZSE2 series pressure switch has a quick response time of 10mS and the plug connector option makes wiring easy and simple. The ZSE3 series is a digital pressure switch (for vacuum pressure) with LCD readout for general pneumatics purposes. The ZSE3 digital pressure switch allows the calibration of two independent outputs. Modular version can be integrated with ZX system. Response time can be selected from 0.25, 0.5, 1, 2, and 5 sec. Flow direction can be changed after installation. Consumption: 25 mA or less. During the past few years it's generally been accepted that analogue float type flow meters cannot always provide an accurate indication of performance when used in low flow rate applications. But now, thanks to R&D engineers from SMC, the world's leading automation experts and their new Series PFM Digital Flow Switch using MEMS technology, this simply isn't the case.Developed initially to detect microchip component adsorption in vacuum and early clogging in both filter and nozzle applications, the new Series PFM Flow Switch is incredibly compact and lightweight compared to existing flow sensors thanks to its micro electro mechanical system (MEMS) sensor. With its unique integrated flow adjustment valve, which can be added or disconnected by simply removing its retaining clip, linear flow rate can be adjusted manually by rotating the flow rate adjustment knob. Further features of the PFM are the dual colour digital display which indicates any performance irregularities at a glance and due to its MEMS sensor both straight or elbow piping options are possible making this the perfect flow switch when space limitations are an issue.Currently the PFM range is available in four maximum flow rate options 10, 25, 50 and 100 l/min and is suitable for use with air, nitrogen, argon or carbon dioxide. 2-colour digital flow switch for dry air and N2. Large flow rates, up to 2000 l/min. Wide measuring range, rangeability: 100:1. Quick response: highest speed 0.05 s.
Flip vertical option to adjust display's orientation. 3-colour digital flow switch for dry air and N2, with enclosure IP65. Wide measuring range, with rangeability: 100:1. Display can be rotated 360º to suit installation. SMC offers a variety of digital flow switches. Series PF2A for air, PF2W for water, PF2D for deionized water and chemicals. Flow rate setting and monitoring are possible with the digital display. Integrated and remote type displays are available for different types of application. Water resistant construction is used conforming to IP65 protection. Switching from real-time flow rate to accumulated flow is possible. For applications requiring extremely accurate small work piece detection, such as in the electronics industry, the use of a standard pressure sensor may not be sufficiently precise enough to match these exacting and very specific needs. However, thanks to the R&D engineers at SMC, the world leaders in pneumatic technology and their latest flow sensor ? Series PFMV ? these concerns may now be a thing of the past.Developed initially for the semiconductor market, the PFMV Flow Sensor which uses very low pressure suction, through its specially designed flow passage, can detect the presence of a work piece during an application by simply checking for any flow rate changes. With a response speed of 5ms or less, this suction technology can also be successfully used to detect blockages in applications using nozzles or leakage in moulding applications which often result in minute pin holes and ultimate component rejection.Further features of the RoHS compliant PFMV are its extremely compact size making it ideal for when space is an issue, its facility to be mounted together ? similar to a manifold arrangement ?, its low flow rate, and its abilities to determine a vacuum break and to be used with either a digital or analogue display including auto-shift input. The paddle style flow switch, series IF3 detects and confirms liquid flow. The series is generally used in fields such as air conditioning, water supply equipment, etc. Enclosures include a standard type for indoor applications away from moisture; drip proof (JIS C0920) which can tolerate water drip in indoor or outdoor applications; and splash proof (JIS C0920) which has a sealed construction that can tolerate hosing or salt laden atmospheres. IFW series flow switches detect and confirm liquid flow. They are applicable to general industrial machines and various other applications. The IFW series will detect the flow of water and other non-corrosive fluids. The detection range is from 1 to 50 liters per minute. The flow setting can be adjusted with a screwdriver from the outside of the unit without removing the cover. SMC offers a variety of auto switches for actuators and air grippers. ; Solid state switches are available in a general purpose type or with 2-color indication, which allows the optimum operating position to be determined by the color of the light. ; Solid state switches are also available in 2-color indication with diagnostic output, water resistant 2-color indication, built-in OFF-delay timer (200 ms), magnetic field resistant, heat resistant and wide range detection configurations. ; Various lead wire lengths are available. SMC offers a variety of auto switches for actuators and air grippers. ; Reed switches are available in a general purpose type or with 2-color indication, which allows the optimum operating position to be determined by the color of the light. Magnetic field resistant, heat resistant and wide range detection configurations. ; Various lead wire lengths are available. Expanding the number of actuator series that accept compact auto switches.One auto switch for four different mounting types. SMC's pre-wired connector auto switches are available in 3 or 4 pin 8mm style, or 4 pin 12mm style. 3 standard wire lengths are also available: 0.5m (S), 1.0m (M) and 3.0m (L). With the use of the pre-wired connector switch, the need for minimum order quantities for "special" auto switches with connectors is eliminated, and wiring with the use of standard connectors is simplified.